Oh how I love The Reading Game! This is a game designed to help teach your child words by memory, just as you would sight words. However these are not sight words only. They are words that range from cat (game 1) to wombat (game 6). Here’s how it works. You have 6 decks of cards and 6 books, that is a book and deck of cards for each level/game (see picture below). There are 30 different words per level, broken into 6 groups with 5 different words per group. This is so the child can learn the 30 words slowly, 5 at a time. Here’s how it works. The first level is Skunk. There is a number one on the front of the following cards: can cat is me not There is two each of these cards and you play memory using them. Each time the child sees the word they say it. You will have to help them at first but soon they’ll be saying the word on the card easily. Once this happens you add the next 5 words in the level. In this case it would be sad she stay this with. As you can see some of these are sight words, but certainly not all of them. You are increasing their reading vocabulary greatly with each group of words, especially if they’re only 4 or 5 years old. After mastering the first 10 words there are two test sentences for the child to read. If they can read them, add the next 5 words to the group. Continue until you they have learned all 30 words for that level/game and then reward them with the book. The book tells a story using only those 30 words they’ve learned. They will be so proud to find that they can read it all by themselves. 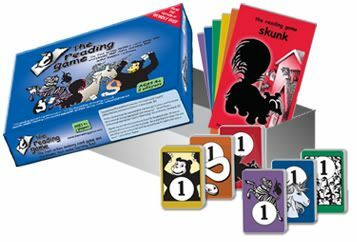 The Reading Game is a great game to help aid in learning to read, however it is not a total reading program, in my opinion. Yes, if you have a child who is going to just naturally pick up a book and learn to read as easily as falling off a log, than The Reading Game may do that for you. But for most kids, such as the ones I have, this will not be the case and there will be many hours of teaching before the key will turn and the light will come on. I’m very happy to have The Reading Game as part of our learning process. You can learn more about The Reading Game at their website. There are several video’s and testimonials, as well as suggestions for implementing phonics into the learning. The Reading Game cost $24.95 each. If you purchase 8 or more you can take an additional 15% off. The game is designed to be played with the tutor and one child, however it may be possible to play with two non-competitive kids (not mine). The recommended age is 4 and up. I would think the middle schooler would not really enjoy it but most any elementary child would, especially if reading is not a strong point. Check out the crew website to see what other homeschoolers thought of this program. **Disclaimer: As a member of the TOS Homeschool Crew, I received this product free of charge, in exchange for my honest opinion/review. For more honest reviews from real homeschoolers, visit the TOS Crew website.